During his hospital stay in February, my son had a bad reaction to one of his anti-seizure medicines and developed ataxia, which is the loss of full control of bodily movements. For two days, he couldn’t walk, or talk, or hold his head up. We had to carry him to the restroom and feed him, which was a shock considering he was ice skating only the week before. We didn’t know if this was a permanent situation or if he would ever recover. Fortunately, by the third day he started to move again, although he was incredibly shaky. His gross and fine motor skills were both severely impacted, and we watched through our tears to see him struggle to hold himself up or hold a spoon or form a thought. While we were still in the hospital, he started occupational therapy, physical therapy, and speech therapy to try to rebuild the skills that were damaged. By the time we left the hospital a few weeks later, he was functioning at about 50% his pre-admission level both mentally and physically. Since then, he has continued his rehabilitation and, while he is still wobbly and has impulse and attention difficulties, he is better than he was. The therapists at our hospital have been amazing, and they’ve incorporated games as a way to engage my son for rehab without realizing that it what he’s doing. 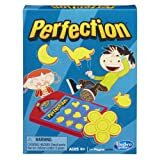 Taking a cue from his occupational therapist, this week we’ve been playing a lot of Perfection. The game helps develop two different skills. First, the fine motor control required to grab the stem of each piece and navigate the shape in to the board is challenging. I watch as he tries to twist the stem with his fingers to rotate it to fit, dropping it many times but diligently picking it back up. When he rushes or when his ataxia is worse, it’s helping him really focus on muscle control. 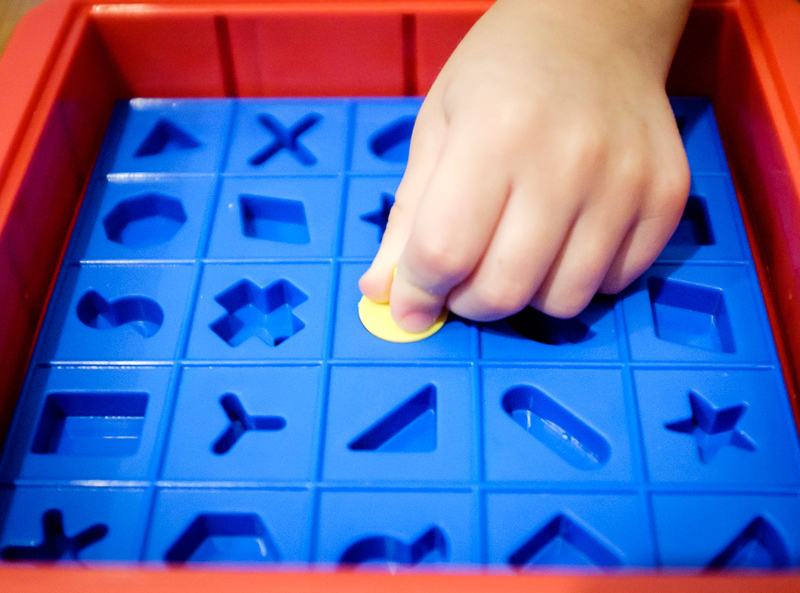 Cognitively, he’s having to identify the shape and scan the board to find the match, which can be difficult because there shapes that are similar to each other. 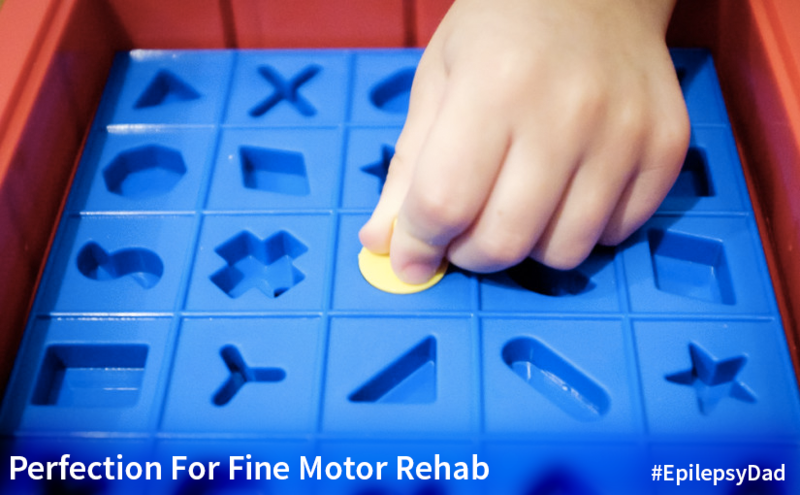 He also needs to align the shapes, so his mind has to tell his fingers which way to rotate the shape. Oh, and he’s doing it against the clock. For now, we set simple goals, just trying to beat his score from the last time. Sometimes he does, other times he can’t. But we encourage him to keep trying because every time he plays, he’s exercising those muscles and pathways that were damaged, which is what they need the most.